As you know, I’m obsessed with the galette! It’s such an easy peasy way to bake a pie, sweet or savory. 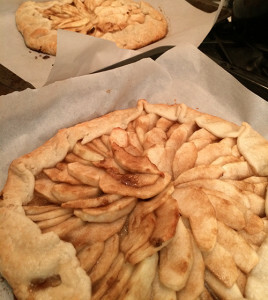 I found a simple apple galette recipe and have now made it twice. Perfect for the hectic holiday season. I’m providing the galette recipe below in slight adaptation from the original posted at Bon Appetit. Trade Joe’s pie crust comes 2 to a box, already rolled out in a circle shape and rolled up to fit into the box. There is absolutely no need to dust it with flour. I literally thaw it for about 2 hours outside of the freezer, unroll it straight onto the baking pan lined with parchment paper, patch up any spots that broke or cracked with the unrolling, and it’s ready to go! I like using Pink Ladies for the apples to get that bit of tartness, peeled and cut into about 1/8″ thick slices. Bring the butter to a boil until browned, and then add the vanilla at last moment. 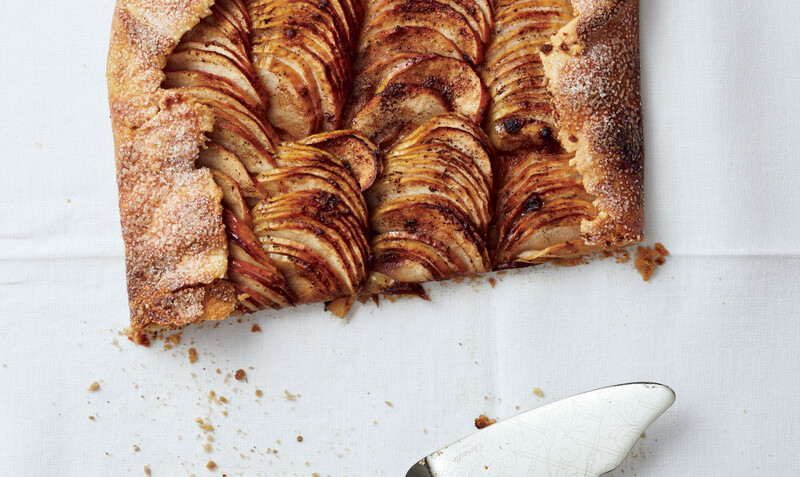 Let it cool for a moment while you lay out the apples. If you really love a pie loaded with fruit, you can add a pretty generous overlapping of thinly sliced apples. Arrange the slices in a pretty pattern or not, the galette is the best because it’s imperfectly rustic! Just make sure to leave about 1.5″ from the edge of the pie crust. Brush the butter on top of the apple slices and sprinkle with the brown sugar. Fold in the edges of the crust. Again, if the crust cracks when you fold it in, just press it in with your finger. Beat an egg and 1 tsp. of water and brush on the exposed pie crust to get a nice brown color (I’ve also skipped this step in laziness and it’s totally fine, just doesn’t brown as nicely). Sprinkle the edges with granulated sugar. Put it in the oven for 40-50 minutes, turning once halfway through. That’s it! A galette for you, and a galette for me.